This Polish image forcefully expresses Poles' sense of betrayal at their exclusion from the 1946 London victory parade. 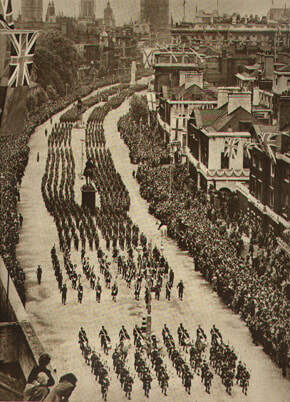 The 1946 Victory Parade drew enormous crowds; celebrations went on into the night. 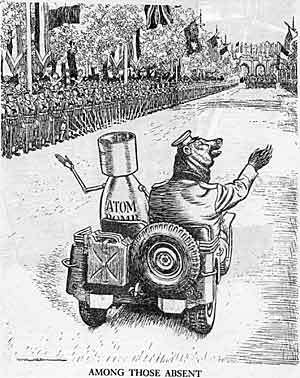 Punch cartoonist Illingworth, June 1946: is he saying that Russia should have been in the Parade or is he linking Russia with the menace of the atomic bomb? In June 1946 the streets of London were crammed with crowds celebrating the Allied Victory Parade in which flags and military units of the various Allied nations that had fought in the war were paraded in a huge procession. Countries represented ranged from the USA to Nepal, Mexico and Luxembourg. But the parade itself was emblematic of the rivalries resulting from a new and different international conflict: the Cold War. Three combatants were missing from the parade - the USSR, the newly formed Communist state of Yugoslavia and the Polish forces such as the various Polish Air Force squadrons. 200 000 Poles who had fought on the Allied side. They had pledged loyalty to the Polish government-in exile (stationed in London during the war).This body included a wide range of political groups from left to right, but excluding the Communists. This government-in-exile had been working on a programme of social and democratic reforms to implement when the war ended. However, its members along with those of the Polish armed forces who fought on the Allied side bitterly opposed the Soviet Union both for its dictatorial nature and for its role in the 1939 Nazi-Soviet Pact which divided Poland between Germany and Russia. 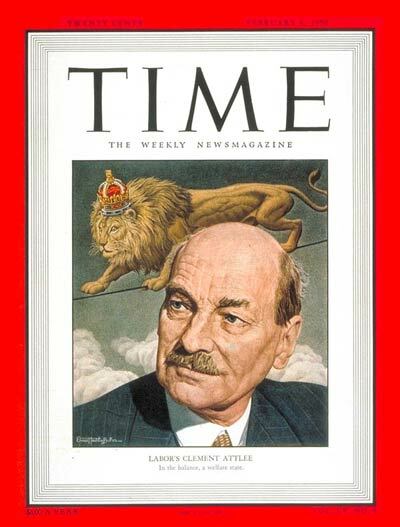 Clement Attlee became Britain's Prime Minister in the July 1945 general election held a couple of months after VE Day. months after VE day. His Labour Party won in a landslide against the Conservatives, and Attlee replaced Churchill as Prime Minister.Attlee immediately faced a host of postwar problems. Britain's economy had been exhausted by the war, western Europe faced starvation and financial collapse, key parts if the Empire -especially India - were independence. In addition, Attlee embarked on a sweeping programme of nationalising key parts of the economy such as railways and iron and steel industries.. Unfortunately for the Poles the Yalta Meeting of February 1945 between Churchill, Roosevelt and Stalin tried to solve mounting diplomatic and strategic tensions between the big three powers at the expense of Poland. By this date Soviet troops had already moved into Poland and taken control. a procommunist provisional government had been set up and Stalin was determined that Poland would come within the USSR's expanding empire. Although the USA and Great Britain believed that the London-based noncommunist Polish government-in-exile was most representative of the Polish people, both countries gave in to Russia's dominant de facto control. Yalta's final agreement expressed the pious hope that a “more broadly based” government should be established in Poland. Free elections to determine Poland’s future were called for sometime in the future. Many British and American officials opposed the agreement, realising that it was condemning Poland to the status of a a puppet-state with the Soviet empire. But in harsh reality, what could Roosevelt and Churchill do, given Russia's entrenched strategic and military position in Poland. Start another war over Poland? Churchill, Roosevelt & Stalin at Yalta , Feb. 1945. An obviously ailing FDR would be dead within weeks. Cartoonist's view of the immense challenge facing the 'Big Three' at Yalta. By 1946, with Churchill out of power after the 1945 General Election, the Labour government of Prime Minister Clement Attlee decided to accept that Russia was in control of Poland and and a broad-based democratic Polish government and state was impossible. Accordingly, Britain recognised the Communist-Russian dominated Provisional Government of National Unity, soon to be renamed the Polish People's Republic. Unfortunately, one consequence of this diplomatic about-face was that no Polish forces who had fought for the Allies were represented at the Allied Victory Parade. in order to appease Russia.This caused a controversy continuing to this day, with Churchill, other politicians and members of the RAF and other British armed forces protesting in vain. The USSR swiftly set about removing removing supporters of the wartime government -in-exile in order to prevent their plans to establish a democratic postwar Polish government in its form as the short-lived Polish Government of National Unity set up in March, 1945. The above image illustrates the show trial of 16 leaders of the National Government in Moscow in June, 1945. The sixteen included leaders of the Polish Underground wartime resistance to the Nazis. They were kidnapped, taken to Moscow, tortured by the NKVD, forced to sign false 'confessions' and put on trial for "drawing up plans for military action against the USSR".